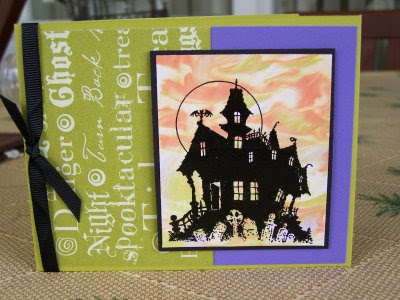 Stamp Set: House of Haunts Card Stock; Kiwi Kiss, Basic Black, Lovely Lilac & Glossy White. Ink: Versafine(non SU) Black Embossing powder, Black Grosgrain Ribbon & Ghostly Greetings Designer Paper. Wow...2 videos in a row for you guys!! The time gods are being good to me this week. My up line Terry recently held a Halloween Spectacular and even though I'm far away I still participated via USPS..My set and projects arrived yesterday and I couldn't wait to start assembling them. The set is House of Haunts. This card features the Shaving Cream Technique.If you have never done it before it's so COOL!! You get a such a cool background with it. Hope you enjoy the video! That was very fun! Thanks for sharing! You did a great job!